Bricklane ( ব্রিক লেন) the Bangladeshi quarter of London. Names of places in the UK really are literal. 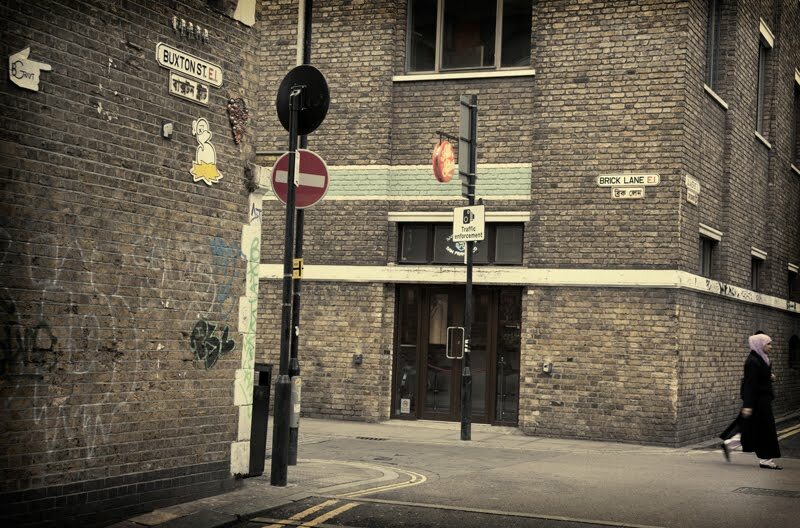 Bricklane was where bricks were manufactured (in the 15th century) and the buildings are made of brick. From bricks it moved to brewing beer and weaving and tailoring cloth. All this colourful past is alive and well in the current markets. Petticoat Lane and Spitalfields. Great shot. Love the details. Love the commentary and the photo. Interesting details. I wonder if the Black Raven is still going in Petticoat lane? Bricks and stonework are my favorites! Great shot, I love all the different things to look at in it, the lady walking by, the street names in the two languages, the graffiti...and perhaps directions to Gavin's bachelor party? London, you are so special. Great photo. Love the detail. It's not pretty, but it's interesting. It's nice to discover all this things,thank you! Nice image. Plenty of wear and tear, but also plenty of life. It must have been a village lane once upon a time. London is a series of connected villages.